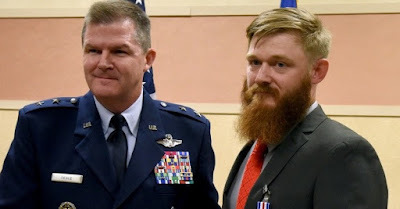 Under fire and drenched from head to toe in the frigid waters of Afghanistan's Bala Murghab River, former Airman 1st Class Benjamin Hutchins refused to leave the two soldiers who needed his help. Hutchins, a tactical air control party airman, fought back and refused to give up on the two soldiers, who were being swept away by the river's current, until reinforcements arrived. For his actions on that day in 2009, Hutchins on Friday was awarded the Silver Star, the nation's third-highest award for valor. "It's not a medal for me," Hutchins, who is now medically retired, told Air Force Times. "It's a medal for all the other folks who are slaving away right now and doing the same stuff but not getting the recognition." Hutchins, who was assigned to the 14th Air Support Operations Squadron at Fort Brag, North Carolina, was honored Friday, exactly seven years after his actions in Afghanistan.